ON THIS DATE (May 11, 2005) ... The Boston Red Sox end a game for the second consecutive day by hitting a walk-off home run off the same pitcher, a feat only accomplished five previous times in major league history. 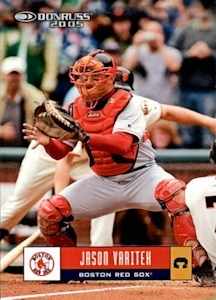 Oakland Athletics closer Octavio Dotel, who gave up the decisive blast to Kevin Millar the previous day, is victimized today by Jason Varitek in the bottom of the 9th inning, to beat Oakland, 6-5. Oakland right fielder Bobby Kielty, felt some pretty tangible pain in his side after crashing into the wall beyond Pesky's Pole in a gutsy, yet futile attempt to keep Varitek's ninth- inning blast out of the seats. Varitek's two-run homer lifted his average to .343, gave him seven home runs in just 102 at-bats, and gave the Sox their second walkoff home run victory in as many days, 6-5. Both days, the Sox trailed by a run going into the bottom of the ninth, both times David Ortiz walked to begin the comeback, and both times a Sox player Kevin Millar on Tuesday, Varitek yesterday took Octavio Dotel for a long, painful ride. Varitek, with the second walkoff homer of his career (both vs. Oakland), escorted Dotel into the record books. This was just the second time the Sox have won on walkoff home runs on consecutive days on July 21 and 22, 1935, Sox pitcher/pinch hitter Wes Ferrell accomplished the feat. And, this marked just the sixth time a major league team has hit walkoff home runs in two straight games off the same pitcher. Varitek took a sinker away and broke a bat fouling off a cutter to begin the at-bat. The 1-and-1 pitch was in on his hands, and he turned on it.